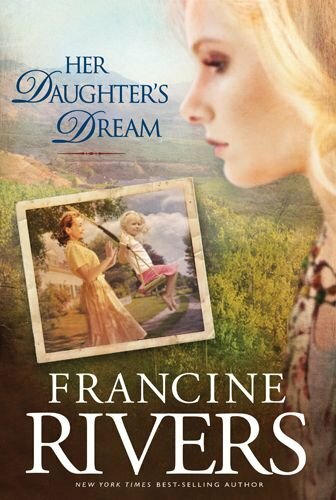 Her Daughter’s Dream is part two in Marta’s Legacy by Francine Rivers. To fully understand and soak in the story you need to start with part one, Her Mother’s Hope. Part two picks up where one left off in the early 1950’s. Hilde is suffering for a second time with TB and is in a hospital room quarantined from her family. Her husband Trip calls Oma Marta to come and help them so that Hilde can come home to recover and care for the children. Hilde is surprised that she does. Marta and Carolyn form a close bond while Hilde is recuperating, and the relationship between Hilde and her daughter never grows to be the close bond that she desires. Years later Carolyn goes to college and soon after her brother Charlie goes to Vietnam. Carolyn drops out of college to protest the war, experiments with the drugs and alcohol of the hippy era. Still close with Marta, but never having felt loved by Carolyn. She turns from the God she once held dear after her brother is killed in the war. Carolyn comes home after all her options are exhausted, pregnant with May Flower Dawn. The cycle continues as Carolyn rebuilds her life while Hilde cares for Dawn. The relationship between Grandmother and Granddaughter overtakes the one of mother and daughter. This saga is rich in historical data and loaded with well rounded, unique characters. A heavy read about the generational sin of pride and secret keeping. Of not reaching out to the ones you love to make sure that they know you love them. I had hoped that this second part of the story would bring some redemption as the first one left me feeling sad and not at all satisfied. I cried at the end of this novel and it truly made me look at my relationship with the women in my life.. thanking God for them. My favorite Christian book is Redeeming Love by Francine River.